Although a longer drive, it was decided to walk from Jeffreys Track rather than starting at Myrtle Forest. The upside was a shorter walk along the fire trails and of course the route through the bush to the Mount Patrick summit was the same whichever way was chosen. Mind you the Jeffreys Track is most uninspiring and you are on it for some 3.6 k and 60 minutes twice. Since last visit there the potholes that attract 4WD enthusiasts have got wider and deeper. We could not really understand why anyone would want to subject themselves and vehicle to such torture, but I guess they would say the same about bushwalkers. The walk along the East West Trail is not unpleasant at all and it took us some 45 minutes to get to the start of the bush section. We did notice that a couple of plastic lined dams had been put in in recent times, and they are a strange sight, but presumably hold water better that way. More of a disturbance was a large clearing that is probably there as a fire vehicle turn around spot. The start of the bush track was easily spotted from a pile of rocks, but it is somewhat overgrown once on it. But there is enough usage to keep it quite obvious through the thick and numerous tapes have been added to mark the way as well. Once through the initial thick bush you come to an attractive open area, known as Georges Flagland. 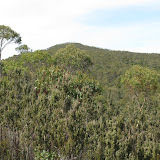 It was most pleasant weaving around big tea trees from one opening to another, but it was not very long before a denser environment was reached and finally quite nice bush leading to the top. At this point the old hut ruins were spotted as was a rock top with views that selected itself as the lunch spot. It took and hour from the turnoff to the summit, including the 5 minutes at the hut site. Return was initially by a flagged route that we hadn't followed on the way up, until re-joining our inward route a 300 metres downslope. From then on it was a basically uneventful retrace of the mornings route, apart from me falling off a slippery log. We did however meet two fellows from Broken Hill doing the Tasman Trail on mountain bikes and a father with a quite young kid sitting on his knee as he roared about on an ATV (small 4 wheel vehicle) whilst his other son zoomed about on a trail bike none with helmets.